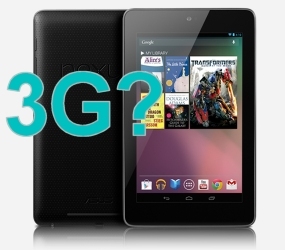 The Nexus 7 tablet is currently only available with WiFi only, however that could shortly change with rumours suggesting that Google are working on a new model with 3G incorporated. The reports also claim that ASUS are reported to be ramping up production with Google officially announcing the new model in a couple of weeks time. The actual launch would be around 6 weeks time which would be roughly the same time as the iPad Mini and new Kindle devices go on sale. The price would obviously be higher than the current £199.99 WiFi only model, however mobile operators will have the option of tying users into a monthly contract and therefore possibly offer the new tablet for free. Since it's release in July, the Nexus 7 has received glowing reviews from industry experts with the only criticism that it lacked 3G connectivity.